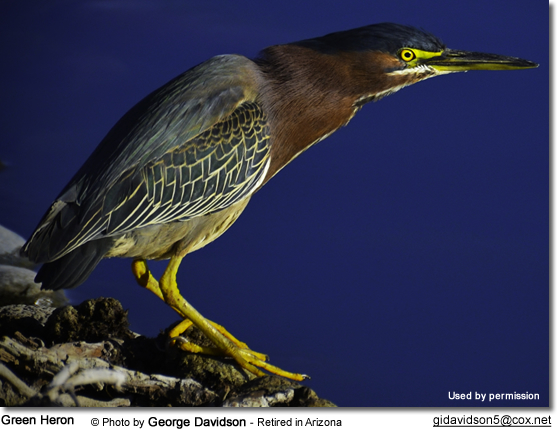 The Green Herons (Butorides virescens) - sometimes called Little Green Herons - are amongst America’s most recognizable wetland birds. Their wide range stretches from southeastern Canada through the United States, Mexico, Central America and the West Indies to northern South America. Their common names were derived from their small size (they are comparable in size to large crows) and green plumage details. 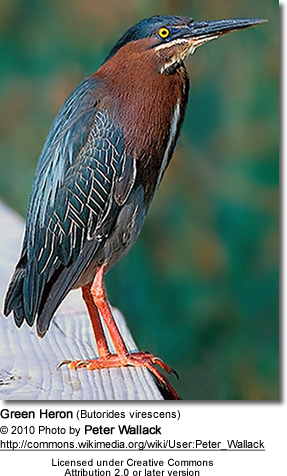 They are most easily identified by their glossy dark bluish-green backs and caps, chestnut-colored necks, dark crown feathers and long, yellowish legs. 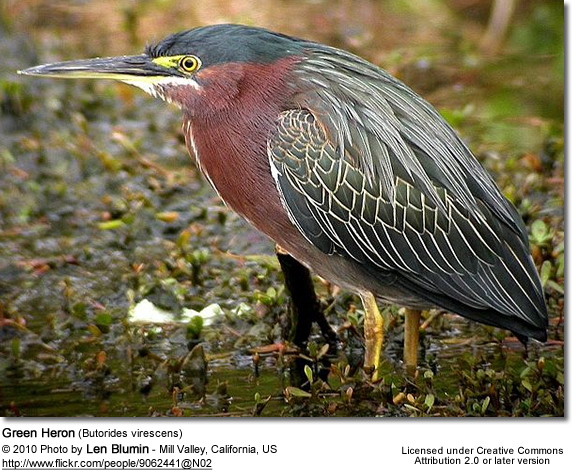 They were long considered conspecific (one species) with the closely related Striated Herons (Butorides striata), and together they were known as the "Green-backed Herons". Even though this species is most conspicuous during dusk and dawn, they tend to be more nocturnal (active at night) than diurnal, generally preferring to retreat to sheltered areas during the day. 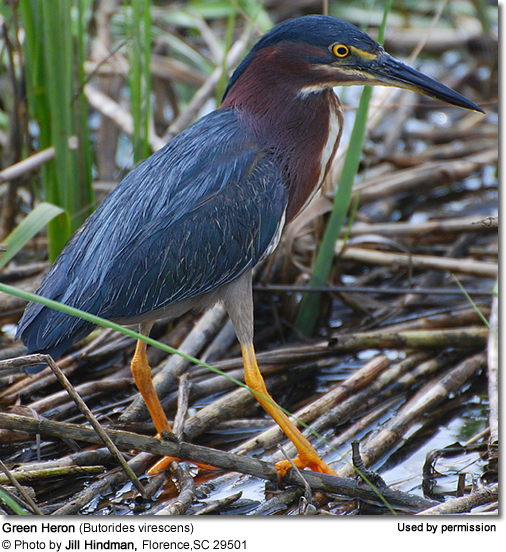 These smart herons are one of few birds to use tools. They commonly drop bait - such as live insects, bread crumps, berries, worms, twigs or feathers - onto the surface of the water to attract fish. 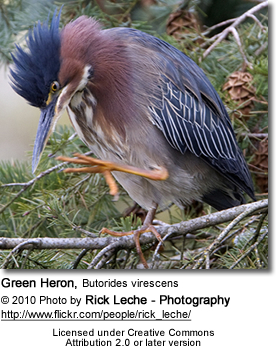 When inquisitive fish appear, these herons grab them with a quick thrust of their bills. This hunting technique has earned them the distinction of being placed amongst the world's smartest birds. 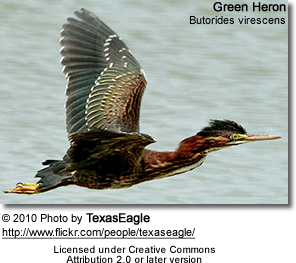 Green Herons breed throughout most of the eastern half of the United States - from extreme southeastern Canada south to the Gulf of Mexico, west to the Great Plains, western Texas and southwestern New Mexico, and south to Central Panama, the West Indies and islands off the north coast of Venezuela. On the Pacific coast, they breed in the westernmost Canadian province of British Columbia south to California and Arizona. In September or October, most will travel south to their wintering ranges. Migratory populations winter along the coast of South Carolina south to Florida, along the Gulf coast; in southern Texas and Arizona; as well as in coastal California and Mexico, Central America and South America (northern Colombia, northern Venezuela and eastern Ecuador). They typically travel back to their breeding territories in March and April and nesting is typically underway by the end of May. Some of the western and southern populations in the United States, and further south are permanent residents (remaining in their territories year-round). These wetland birds occupy shallow fresh, brackish (intermediate between fresh and salt water) and saltwater habitats with clumps of trees, favoring small bodies of water with a combination of dense vegetation and open water. Wintering populations are usually found in coastal areas, particularly mangrove habitats; and breeding generally occurs in swampy thickets. After the breeding season, some birds wander as far as Hawaii and western Europe (England and France). 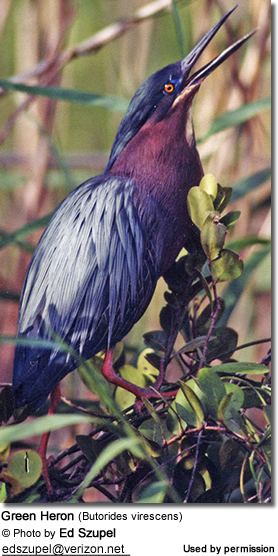 At this point in time, these birds are common and widespread, and their populations appear to be stable. The taxonomy of this species is disputed and uncertain, and changes are expected to occur. The most disputed item is the distinctness of the Caribbean and Central American populations. Some authorities support the idea of assembling the bulk of the mainland population in the nominate subspecies and to treat the other populations as distinct subspecies. Others favor placing all resident populations in ssp. maculata and all migratory ones in with the nominate race virescens. The northern three races - virescens, anthonyi and eremonomus - perform extensive migrations to and from their breeding grounds. All other subspecies appear to be mostly resident. Breeds from southeastern Canada to central and southern USA east of the Rocky Mountains. Winters from southernmost USA to northern South America. Breeds in the USA west of the Rocky Mountains, south to northern Baja California Peninsula, Mexico. Some resident, most migrate to western Mexico in winter. Southern Baja California Peninsula, Mexico. Resident. Range: The Bahama Islands, where they reside year-round. Range: Formerly only referring to populations found on Martinique Island in the Caribbean. Some authorities include populations found in southernmost USA through Central America to central Panama. Summer / Breeding Range: Chihuahua and Durango, Mexico. Wintering Range: South to Michoacan, Mexico. Range: Costa Rica, Panama, northern South America south to Medellin, Colombia and Para, Brazil. Range: Curacao Island off the coast of Venezuela. 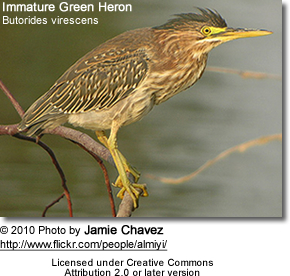 Green Herons are relatively small in size, with an average body length of about 17 inches (44 cm). They range in length between 16.1 - 20 inches (41 - 50 cm). Their wingspan is between 20.5 - 26.8 inches (52 - 68 cm). Migratory populations tend to be longer-winged than sedentary (non-migratory) birds. They weigh between 4.8 - 8.8 oz (135 - 250 g). Their slender, long necks are often pulled in tight against the bodies. Their long legs are greenish-yellow and their bills are long, dark and pointed. 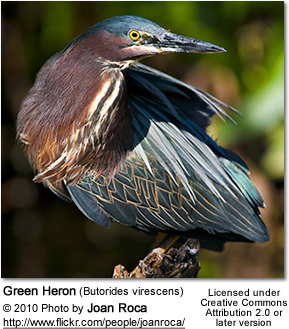 Adults have a glossy, greenish-black cap, a greenish back and wings that are grey-black grading into green or blue, a chestnut neck with a white line down the front, grey underparts and short yellow legs. The very short tail is blue-green above and greyish-white below. The relatively large bill is dark with a long, sharp point. 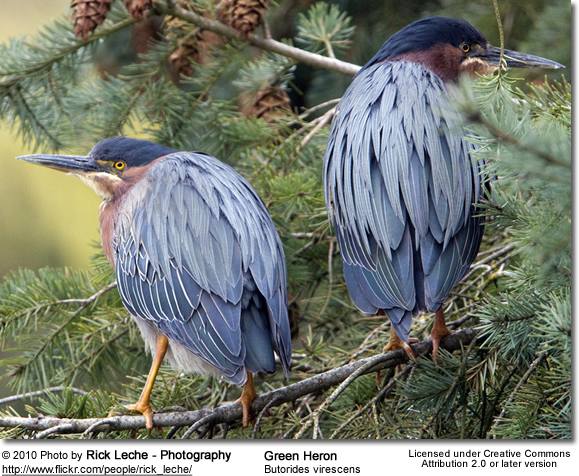 Males and females look alike; except adult females tend to be smaller than males and have duller and lighter plumage, most apparent during the breeding season. 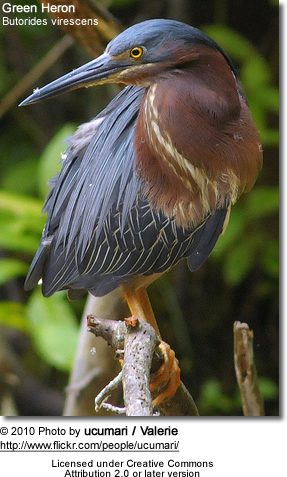 The plumage of immature birds is generally duller, with brown streaks on the sides of the head, neck and chest. The back is brownish with white, tan spots. The legs and the bill are greenish-yellow. Hatchlings are covered in down feathers which are light grey above and white on the abdomen. In flight resembles crows, except for the slower wing beats and the bunched neck give them a slightly different shape. 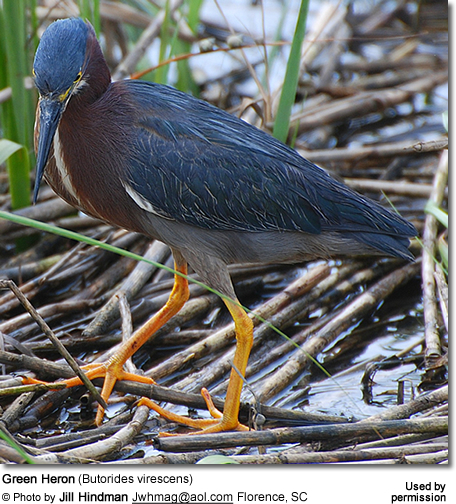 Green Herons have shorter necks and legs than most other herons. 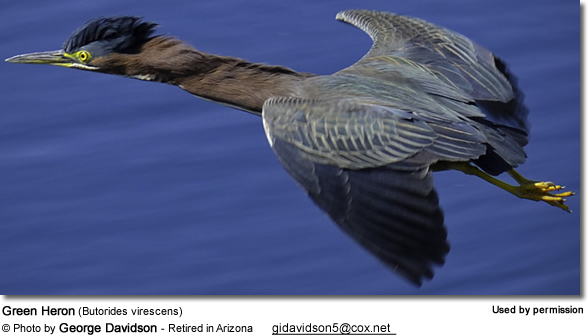 The American Bitterns are larger; their plumage is more golden brown and lighter, and they lack the dark cap. The Least Bitterns are smaller and slimmer; and they have a large pale wing patch; and the underparts are pale. 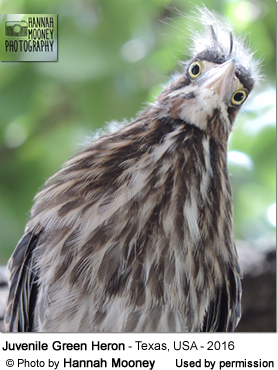 Juvenile night herons are larger and have thicker bills. 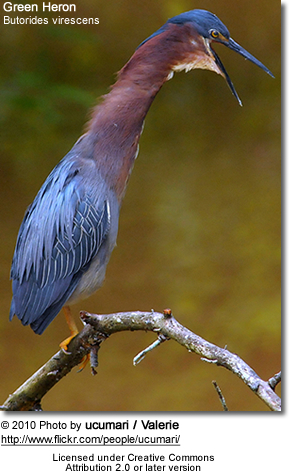 Green Herons mostly feed on small fish, but will also take insects, mollusks, spiders, leeches, frogs, tadpoles, reptiles, rodents and other small animals. Most feeding occurs during the day; however, if opportunities arise or when having to feed hungry ones, they may also hunt at night. They usually forage alone, standing still on the shore or in shallow waters, or perching on branches, as they wait for prey to pass them. They sometimes drop food, such as live insects or other small objects on the water's surface to attract fish. If necessary, they are also able to hover briefly to catch prey, but most of the time, they either walk slowly or stand still; and catch their prey that comes within their reach with an explosive dart of the head and neck. The breeding season is determined by rainfall and access to sufficient prey to feed their young with. 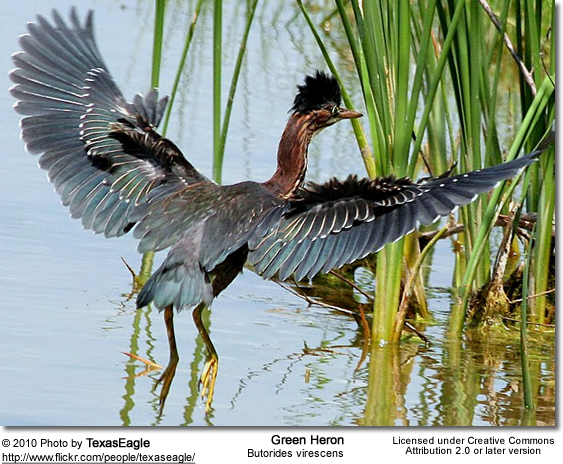 Green Herons are seasonally monogamous; which means that they form monogamous pairs for each breeding season. Migratory populations typically travel north to their breeding ranges during March and April. In their northern range, breeding usually commences in May. Before selecting a mate, the male chooses a nesting site and he defends his nesting territory both before and after mating. 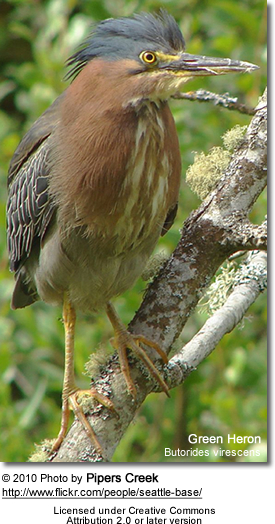 Most nests are found in forest and swamp patches, usually on trees or shrubs over or near water. Occasionally, nests are placed directly on the ground, but rarely though - the nests are usually placed several meters off the ground. The male performs intense courtship displays to attract a female, during which he will noisily fly in front of her with puffed-up head and neck plumage. Once a suitable and willing female has been found, the construction of the nest is a joint venture. The male collects the nest material and brings it back to the female for her to build the platform nest with. The average clutch consists of 2 - 6 pale green eggs, which are laid in 2-day intervals. The incubation starts after the first egg has been laid and the parents share the brooding of the eggs for 19 - 25 days to hatching. The older chick usually has a big size advantage over the younger, and much smaller, chicks. The hatchlings are helpless and dependent on parental care; however, their eyes are open and they are covered in greyish down. Both parents keep the young warm and feed them regurgitated food. The chicks usually start hopping around the nest and snapping at insects when they are about two weeks old and are ready to fledge (leave the nest) when they are about 3 weeks old. They are usually independent when they are 30 - 35 days old. Occasionally the parents will produce two broods a year; this is particularly the case in the tropical parts of this species' range. While standing motionless waiting for prey to come within striking range, they are usually silent; except for intermittent loud squawks. The males' courtship calls are raah-rahh vocalizations given with wide-open bills and whoom-whoom-whoom made in flight, and sometimes, they call roo-roo to the female before landing, and aaroo-aaroo while sitting.